A Production Schedule covers the entire production period of a video production, where as a Call Sheet is in use for the shoot day. 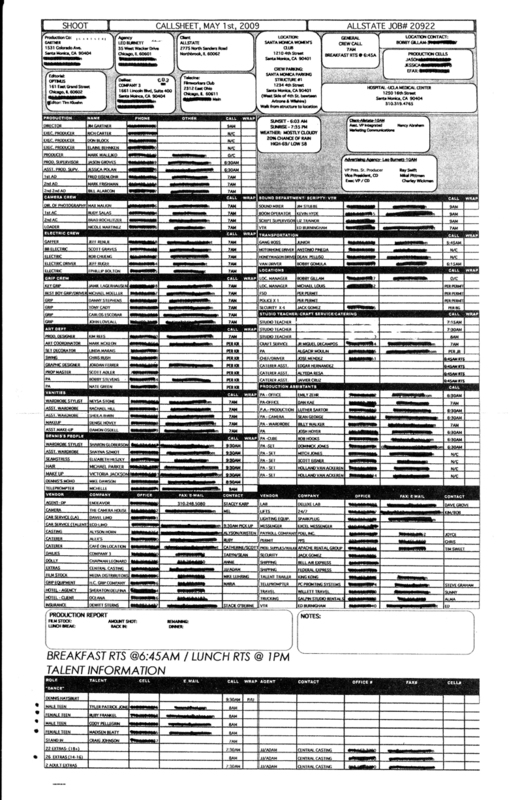 A call sheet covers many functions: contact sheet, location information, shoot schedule, and lastly a call sheet (sic! ): meaning it gives every person on a set from client, to crew, to personnel, actors, and vendors the time they are to show up for work. On big productions there are dozens of people who all ‘report to location’ at a different time. A Talent Release is a contract that an actor, or the person who appears in a video signes to give full consent to being filmed. There are standard releases on-line. It’s important to make sure that the release states that you can manipulate the media in any way you want, that you can use the media for all perpetuity (eternity), and in any medium existing or invented in the future. Most importantly: do not shoot a single frame before you don’t have a signature! When shooting big crowd scenes, using ‘real’ people, i.e. you’re shooting in the streets of Manhattan for instance you can put up a sign saying something along the lines of: By walking down this street (or entering this store, etc), you give consent to be filmed. This can work for small independent films, but for everybody else you need a release form from every single person you see in the picture.